Hi everyone! 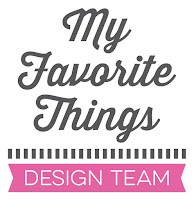 Today is the last day of the My Favorite Things October release countdown. This release is absolutely fabulous! The new products will officially be available on the MFT online store in a few hours!!! Yay!!! The new products will officially be available on the MFT online store on October 3rd at 9:00 pm EST (= Europe: October 4th at 3:00 am CET). Most of the supplies I used for this project are linked in the list at the bottom of this post. I started by blending a top-folded card base with blue and teal Distress inks using a blending tool. I added a strip of patterned paper at the bottom of the card base and stamped the sentiment in black ink. The sentiment is from the Uncorked stamp set and the patterned paper from the Dots & Stripes Neutral paper pack. I stamped the cocktail glasses in black ink, colored them and cut them with scissors. I fixed them on top of the sponged area using foam pads. I added clear Stickles at the bottom of each drink. It sparkles a lot but unfortunately, the picture doesn’t show it (I’m annoyed :-( because it looks a bit "splotchy" but in real life it sparkles so beautifully). I also added some Glossy Accents dots for more interest. Very pretty design, Francine! 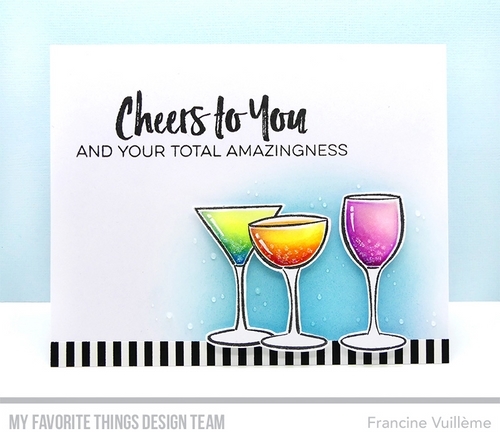 I love how you added Stickles to the bottom of the drinks and Glossy Accents to the background! Such a fun card! Lovely card, and beautiful colouring, as always! Those water drops look so REAL on the blue sponged BG! Such a Beautiful Card. Love the colorfulness of it. This is a great cheerful (no pun intended !) card !! I love the bright colors ! You made the drink really show up by using the stickles- I can almost taste them! Wonderful celebration card! Wonderful card! I love the shading behind the drinks and your wonderful coloring. What a festive card for the holiday season. Thank you for sharing.